Barkart!, Natural art with bite! Australia's Original & No. 1 store for exotic feathers, provider with over 30 years in the business. 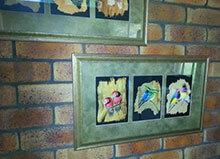 We hold an exclusive and unique feather licence to produce these works and trade in Australian Native Bird Feathers. John is retiring, and selling off all our stock on hand.